Bored of looking at overly airbrushed celebrities on the cover of tabloid magazines? We have a striking visual treat to inspire you this month! Combining feminine beauty and unabashed creativity, this “Colour Splatter Power”tutorial focuses on transforming a pretty portrait into a breathtaking artpiece. Using Adobe Photoshop, we’ll show you how to blend different layers and textures to accentuate this image’s aesthetic value. 1. Start off by creating a new working document with these measurements: 1920 x 1080 px, and resolution: 300dpi. It’s best to keep your background white. 2. Next, open up image 11527675. Copy and paste it to the new document. You may resize and compose the image according to how you would like it to appear. 3. De-saturate the image. you can opt for this shortcut step: CTRL + SHIFT + U. You can adjust this image’s brightness and contrast. This will help you achieve a good contrast. 4. Proceed to duplicate this layer. Next, apply the water color filter on ‘Layer 1’. You can adjust the value of the effect according to your preference. Rename this layer as‘Water color effect’. 6. Then, select ‘Layer 1 Copy’, go to ‘Image’, select ‘Adjustment’ and proceed to ‘Threshold’. Set the value to 153. The blending mode of ‘Layer 1 copy’ should be set to ‘Multiply’. Rename this layer to ‘Threshold effect’. 7. The next step requires you select the ‘Threshold effect’ layer and merge it down(CTRL + E) with the ‘Water color effect’ layer. Rename this layer as ‘Merged’. 9. Copy and paste the splatters onto the document. Set their layer blending to Multiply, then distort the duplicated color splatters to get different shapes and sizes. Use the Hue / Saturation tool to change the color of the other splatters to your preference (CTRL + U), repeat steps until you are satisfied with the arrangements, proceed to merge all splatter layers. Blending mode for this layer will now return to normal. Rename to ‘Water color splatter’. 10. 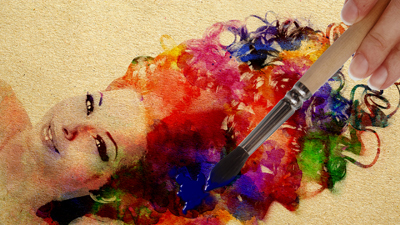 To implement the ‘Layer Mask’ effect, create a layer mask on the ‘Water color splatter’. Then, click on the ‘Merged’ layer. Select all (CTRL + A) and copy (CTRL + C) this layer. Select the ‘Water color splatter’ layer mask. -ALT + LEFT CLICK on the mask > paste (CTRL + V) and Invert mask (CTRL + I). You can refer to the examples below to get a clearer picture. -On the ‘Water color splatter’ layer, use the clone stamp tool to fill in the empty region of the image. 11. Next, copy and paste the paper texture (14113434) on the document and resize it to fit the canvas. 12. Group ‘Water color splatter’ & ‘Merged’ layers together. Set your blending mode to ‘Multiply’. Here’s a variation of the finished design with image 12627469. Now that you’ve learn how to apply these awesome techniques to your artworks, be sure to share the knowledge with your fellow designer friends. See you in our next tutorial!